Sometimes attackers digitally sign their malicious software. Examining properties of the signature helps malware analysts understand the context of the incident. Moreover, analysts could use the signature as an indicator of compromise. Here are some tips and tools for determining whether a suspicious Windows executable has been signed and for extracting the embedded signature in a Linux environment. We'll look at Pyew, Disitool and get a bit of help from OpenSSL. Microsoft's Windows Authenticode Portable Executable Signature Format document explains that the signatures can be embedded "in a Windows PE file, in a location specified by the Certificate Table entry in Optional Header Data Directories." The location of the signature is stored within the PE header's OptionalHeader structure's Security field. 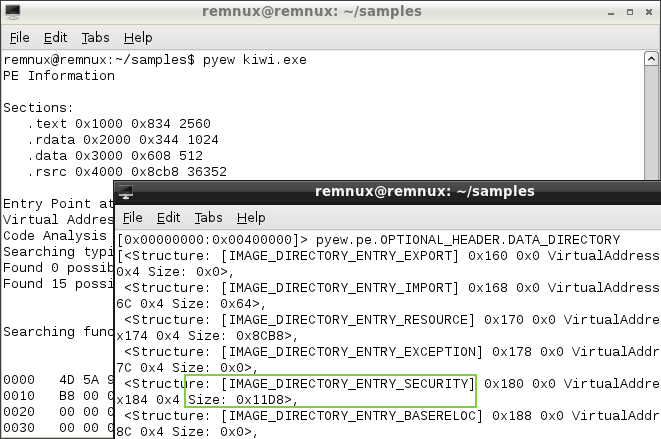 In the Pyew output above, we see that the size of IMAGE_DIRECTORY_ENTRY_SECURITY is non-zero. 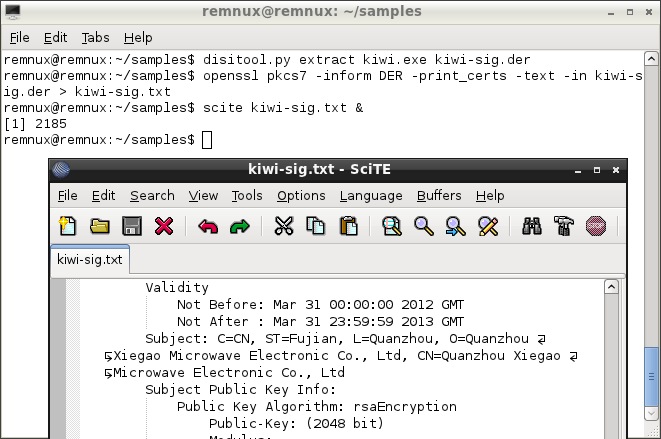 This indicates that kiwi.exe probably includes an embedded signature. Disitool provides another way of determining whether a PE file includes a signature. This tool, created by Didier Stevens, can delete, copy, extract and add signatures. If you attempt to extract a signature from a non-signed file, Disitool will tell you "source file not signed." In the example below, we see that the file has been signed. The author of this malicious file seems to have used a stolen certificate to sign the specimen. Disitool's "extract" command pulled out the signature, so we can examine it. Knowing how to spot signed files and extract signature details can be helpful for malware and forensic analysts. On Windows, you can gather some of these details by right-clicking on the PE file and looking at its properties, as well as with the help of Microsoft's Sign Tool and Sigcheck tools. On Linux, you can accomplish this with the help of Pyew, Disitool and OpenSSL, which are installed on REMnux for your convenience.